June 03, 2015 by Ame L.
Chairs upon receipt were as depicted in photo. Delivery was about 10 days earlier than the estimated timeframe. They look great and are comfortable! 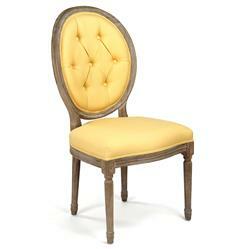 Brighten your room and outlook with this sunny yellow linen tufted oak chair. A limed grey finish details the intricate woodwork on the legs and frame. The luxuriously cushioned back invites guests to relax and enjoy their stylish surroundings.